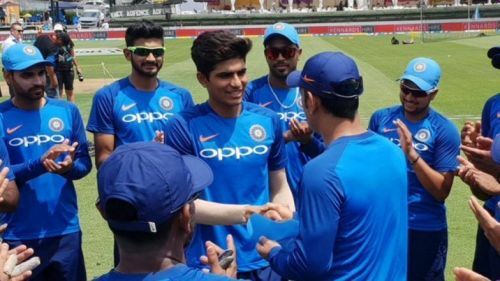 New Zealand vs India 2019: Did India plan Shubham Gill’s debut at the wrong time? After winning the Test and one-day series in Australia, the Indian cricketers arrived in New Zealand with their heads high and spirits sky-rocketing. It was the perfect setting for Virat Kohli to prove his dominance against New Zealand - which many consider as the third favorite after India and England to win the showpiece event of the year – the World Cup 2019. As the series took off, BCCI planned to rest Kohli for the last two ODIs and the three-match T20 series scheduled in the tour. Full marks to Kohli for leading his side to glory; he championed his team to victory inside the first three matches of the ODI series. Winning a series in New Zealand after 10 years also meant Kohli immediately backed up the top 5 awards he recently bagged at the ICC Awards 2018. And by resting star players like Jasprit Bumrah and Kohli against a team like New Zealand, BCCI managed to send a strong signal to some of the most threatening opponents that India are going to face in the World Cup 2019. Shubman Gill, one of the heroes of the Under 19 World Cup, was drafted in as a replacement for Kohli. But did BCCI make a wrong move by planning Gill’s debut at this point of time, when India is scheduled to play less than 10 ODIs before going into the World Cup? Before we decode whether the inclusion of India’s latest batting prodigy was a contributing factor to one of India’s worst ever ODI defeats, let us have a closer look at the budding career of the young chap from Punjab. Gill by no means is an ordinary batsman, and his credentials shed a lot of light on his class and caliber. Averaging over 33 in IPL, Gill has a strike rate of over 145 in the country's premier T20 domestic league. Amidst all the hype and euphoria, Gill entered the Indian dressing room as a youngster waiting to make his debut. With rising expectations from all corners, the pressure got the better of this young lad as he managed a modest score of 9 runs from 21 balls. In this digital era, Indians tend to make superstars out of raw talent. Comparing Hardik Pandya with Kapil Dev or Prithvi Shaw with Sachin Tendulkar is only going to mount more pressure on these budding talents of the country. Rather than asking these prodigies to fit into the shoes of former legends, it would be wiser if the Gills and Pandyas are allowed to make their own identities. At the moment, the Indian team is the best team in the world. Their recent performances prove the kind of dominance they are primed to exercise on world cricket in the near future. But even so, their middle order is still not sorted. The team management has tried a number of permutations and combinations to find the perfect middle order batsman to bat at No. 4. For a while, it appeared that India were going to freeze on Ambati Rayudu. But in the Hamilton ODI Rayudu didn’t disturb the score-card. Then there is Dinesh Karthik, the hero of the Nidahas Trophy. But his role as a finisher should be questioned with the number of failures he has accumulated in his comeback stints. And let’s not forget there are also Shreyas Iyer, Manish Pandey, Hanuma Vihari, Prithvi Shaw and KL Rahul waiting as top contenders for the spot. It’s the dream of every cricketer to represent their country in the World Cup. Has the Indian management ever tried to look into the mindset of middle order batsmen who are likely to feature in the World Cup team? Is it a sound strategy to omit players like Karthik and Rayudu after one game and quickly judge them on the merit of a few bad performances? It’s important for Ravi Shastri and Virat Kohli to figure out if these players are harboring any form of a mental block before going into a game. Lastly, most teams figure out their playing XI a year before a tournament as big as the World Cup. The selectors, captain, and coach then nurture those 11 players by giving them maximum exposure. India, however, have only been experimenting with players. Gill’s inclusion is a good sign for Indian cricket, but will the inclusion create any sort of mental blocks in Rayudu, Karthik and other experienced middle order batsmen? If the answer to that is yes, then induction of players like Shubman Gill can take a backseat until the World Cup is over.